We strongly encourage you to take our online training program if you’re ordering materials for your home and/or to share with your community! 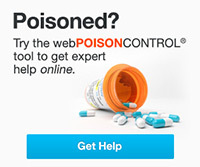 This free course covers important information about the Poison Center’s services and how to prevent poisoning. Minnesota child care providers, EMS personnel, and nurses: This online training was designed to meet 2 in-service hours for child care providers, 2.0 NREMT Individual Competency Requirement (ICCR) hours, and 2.4 contact hours for continuing nursing education activity (50 minutes = 1 contact hour). Upon finishing the course, you will receive an electronic certificate of completion for your record-keeping! You have permission to reprint and/or reformat information sheets, articles, or other content from this website as long as the number 1-800-222-1222 is prominently displayed and the Poison Help logo, if used, remains unaltered. The following materials are available for download in PDF format. If you don’t have Adobe Acrobat Reader, you may click here for a free download. Poison prevention brochures and videos in various languages are available below and can be used to prevent exposures to hazardous substances, promote awareness of poison prevention, and increase utilization of the Poison Center’s services. If you are interested in ordering free magnets in Spanish, please contact PoisonHelp@hcmed.org.